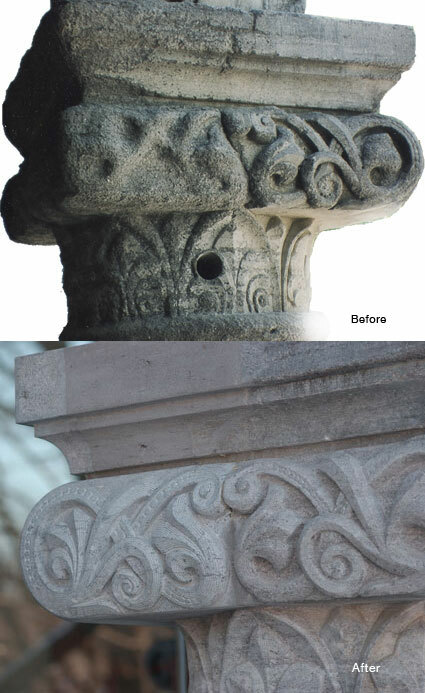 Descripton: Norman Williams Public Library Restoration Project, Woodstock, Vermont Image 1: Making final finishing touches to a newly carved and set replacement stone Image 2: Before and After photo: The restoration on this particular capital shows three different restoration techniques all together in one place. 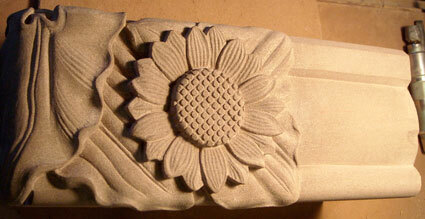 Where possible, the deteriorated stone was re-carved a little deeper to bring out the original look. You see this at the right side of the ornamental band and the lower area. The left side of the ornament and the left side of the upper molding are new "dutchman" inserts carved to match the original. Above the ornamental band and slightly toward the center we have an application of restoration mortar.----- Note: The new stone is from the same quarry as the old and with time it will darken up to match the patina of the old stone. The architect decided not to rush things by applying a tint which I think was a fair call.